You can tell a lot about a chef by the way he sets up his kitchen. Walking into Rhoda for the first time, I could tell that head chef and culinary director Nate Green was a confident man. 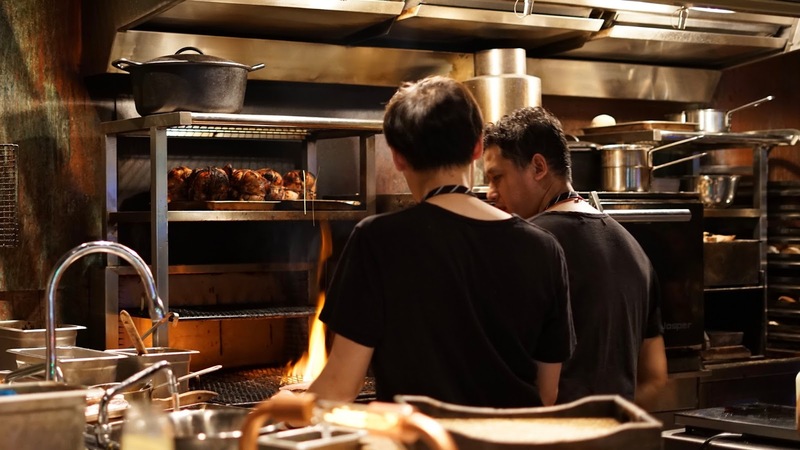 The internationally renowned Joyce Wang designed restaurant has the kitchen as the centrepiece of the restaurant, with the highlight being an open fire grill. 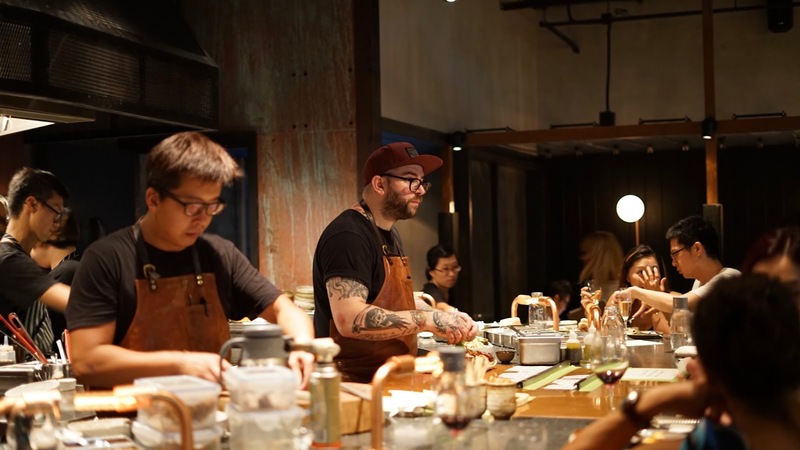 My eye was drawn to the back of the room, where Chef Nate was overseeing the open flame and charcoal grill that was slowly cooking one the restaurant’s signature dishes. 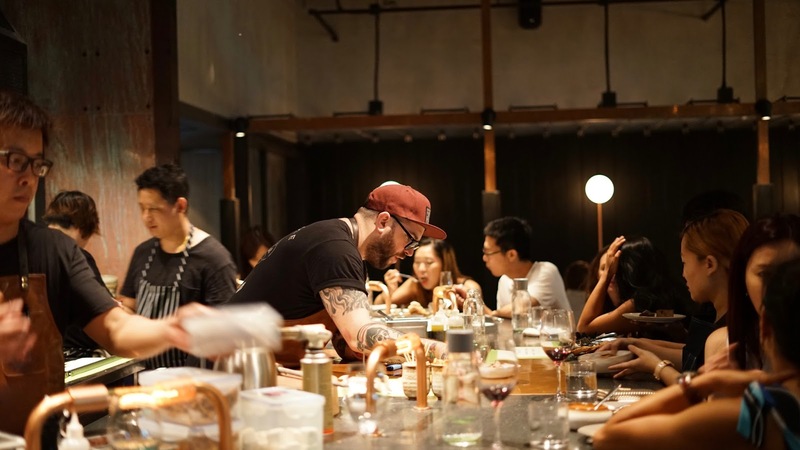 You might recognise the name Nate Green, having worked with the likes of Gordon Ramsey and Jason Atherton, Nate was most recently in charge of Wanchai’s 22 Ships as well as Ham & Sherry. Nate was also recently on local TV for the locally produced Hungry Foodies lifestyle program, a shared experience with Nate appearing on episode three, while I was a little later on episode eight. 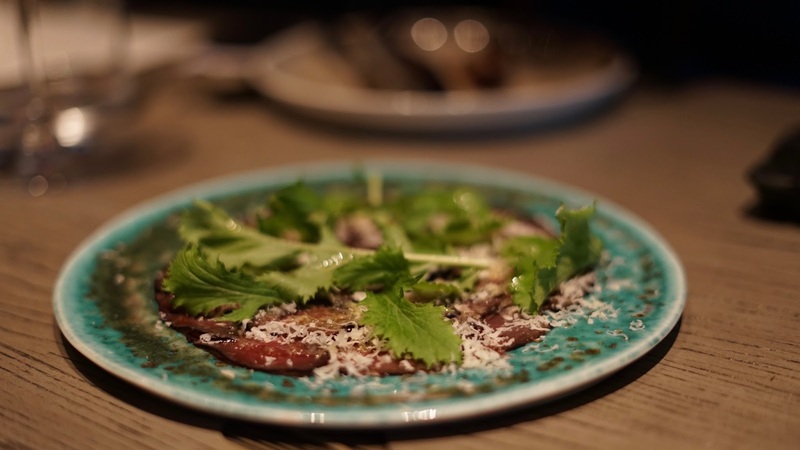 The concept behind Rhoda is very much nose to tail dining, with very little of the ‘beast’ going to waste. 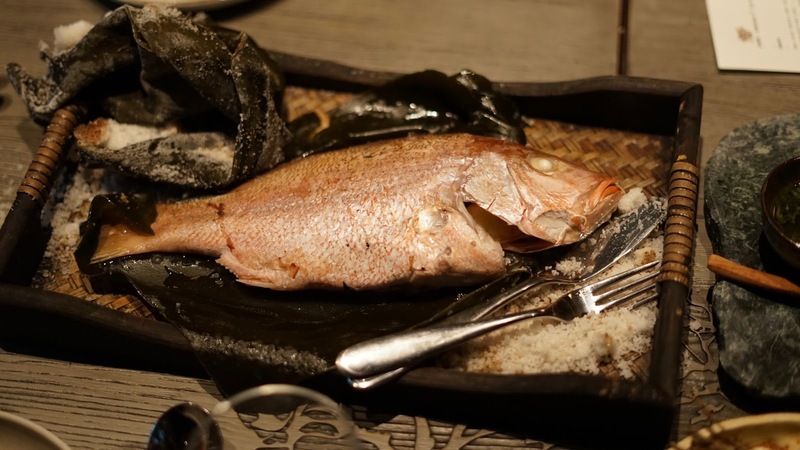 With a menu that changes daily, depending on which beast Nate can secure, the best local ingredients are used to create simple but delicious modern comfort food. Comfort food is the heart of Nate’s current style, drawing on memories of great conversations over a good meal. Taking the vision one step further, there is a large communal table at the centre of the restaurant, aiming to mimic that homely feel. Our menu for dinner was clearly marked as Wednesday 6th of July and consisted of a number of clear types of food, starting with ‘snacks’, then moving to ‘cold’, ‘grill’ and ‘something a little bigger’. ‘Sides’ and ‘dessert’ finished off a menu that upon first glance had way too many delicious looking options to sample in one sitting. But, we were certainly going to give it a try! We were in for a treat, when Nate came over to the table to say hi and fill us in personally about his menu. One of his most exciting tales was the way the bread was prepared on site prior to each meal. 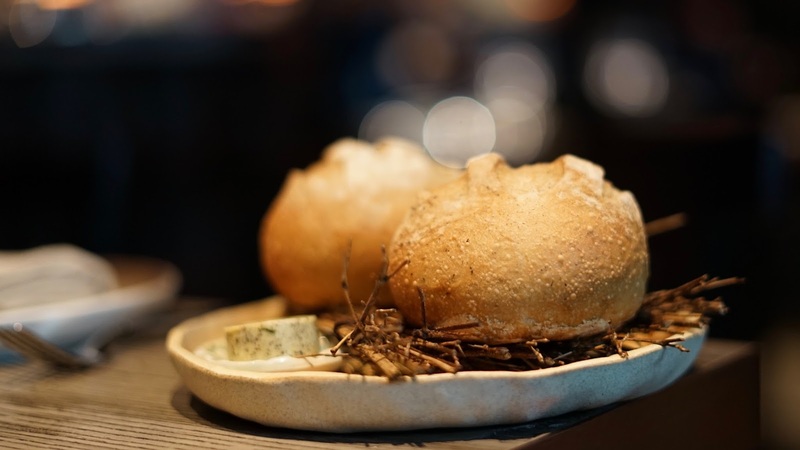 With a live culture and using a stout beer as the base, we were told that the crusty bread would develop and mature as the restaurant did. Interestingly, Nate used the restaurant’s Josper Grill to cook the bread, which would have been no simple task! It was an interesting story, but the proof was in the eating. When the bread was presented, it looked amazing. Cracking open the still piping hot bread, I watched as steam emanated from the golden crust. There was a strong stout flavour to the bread, providing a strong flavour that worked a treat with some salty seaweed butter (served room temperature). We also sampled some of the wild Hereford beef jerky. With it’s dark colouring and chewy texture, the jerky was very strongly flavoured and showed that all of the beast would be used, in keeping with the nose to tail philosophy. Lotus root chips with chicken liver cream were crunchy and the unique looking lotus root chips didn’t last long, especially when dipping into the delicious and creamy chicken liver. 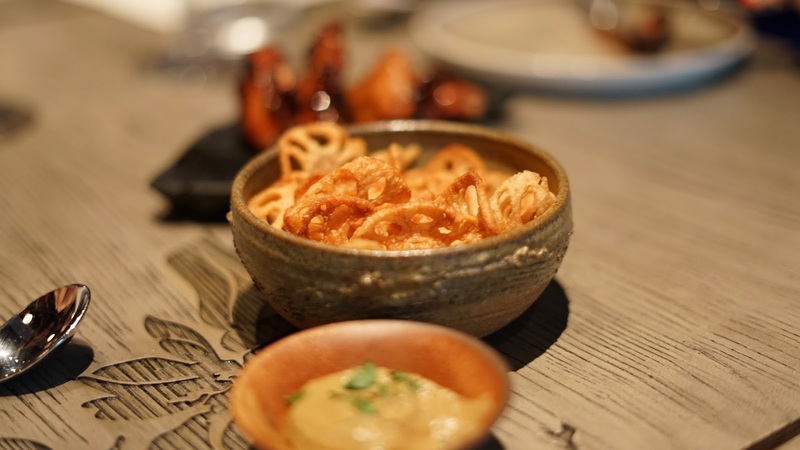 Last of our snacks were the chicken wings glazed with Xeres vinegar, the glaze a dark golden colour as a consequence. 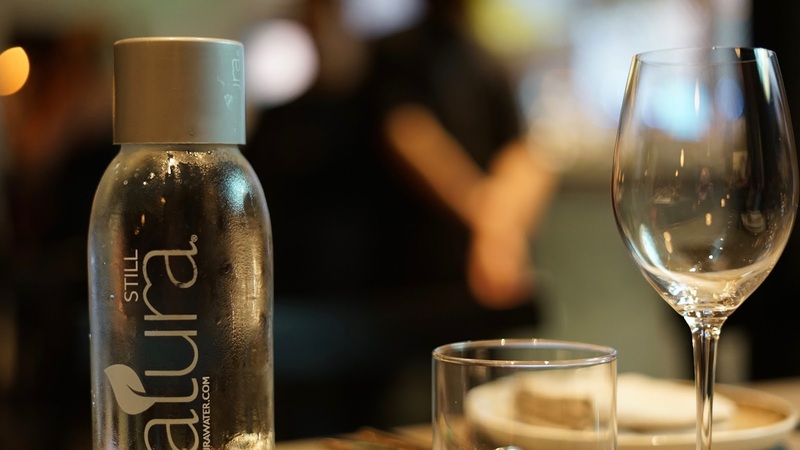 There was an interesting sweet acidic flavour from the chicken wings that was very unusual – I’d not thought that vinegar would make a good glaze, but clearly what would I know! Food started coming to the table thick and fast. 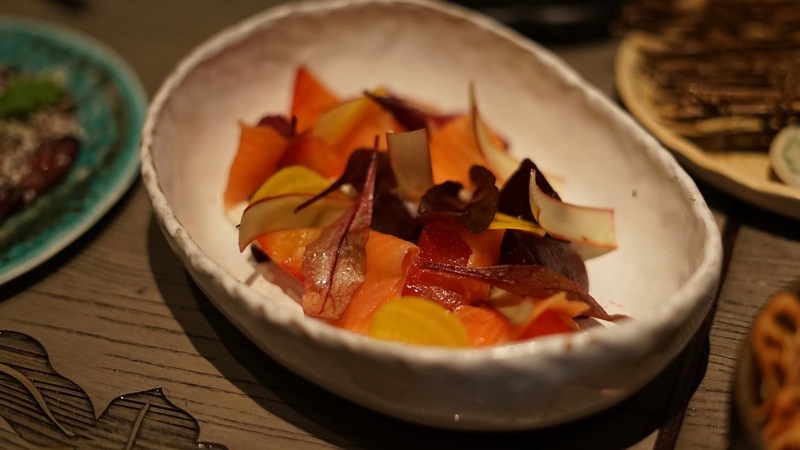 A beautiful dish of cured New Zealand salmon with heritage beetroot and rhubarb was delivered. 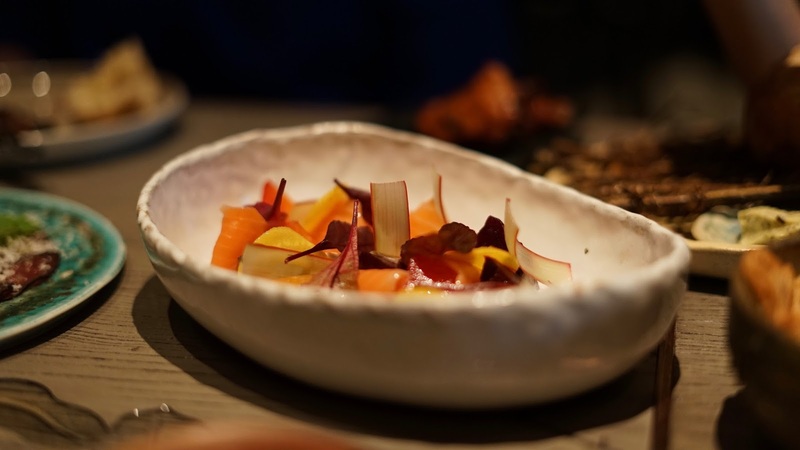 The deep ceramic bowl looked amazing, especially with the colours from the beetroot slices that seemed to be pickled. There was an aioli cream included as a base, balancing out the flavour from the sweet salmon and slightly astringent beetroot and rhubarb. There was a strong yet sweet flavour that hit the palate from the terrine of middle white pig’s head and shoulder with pineapple chutney. 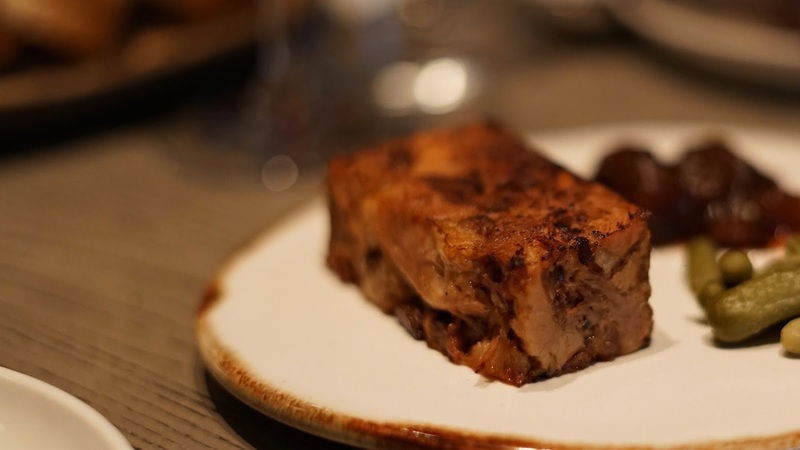 Pressed into a rectangle, the pork was intense yet so well balanced. Well cooked pork shoulder can be a thing of beauty when done well and Chef Nate’s interpretation was wonderful and very more-ish. It was sweet, but adding the pineapple chutney provided an extra layer of competing sweetness, working much better than I would have thought possible. An aqua green plate held a half dozen or so sliced Hokkaido scallops, the contrasting colour looking refreshing and oh-so-inviting. 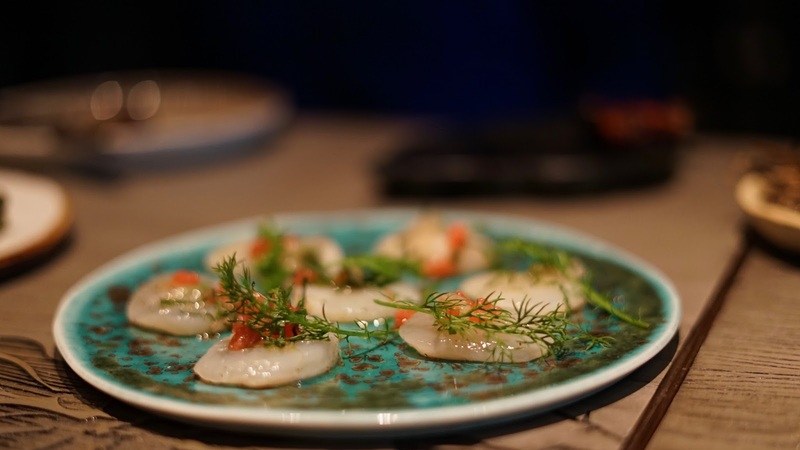 The sweet scallops were raw and had a tiny hint of acidity from some pink grapefruit and pickled ginger. 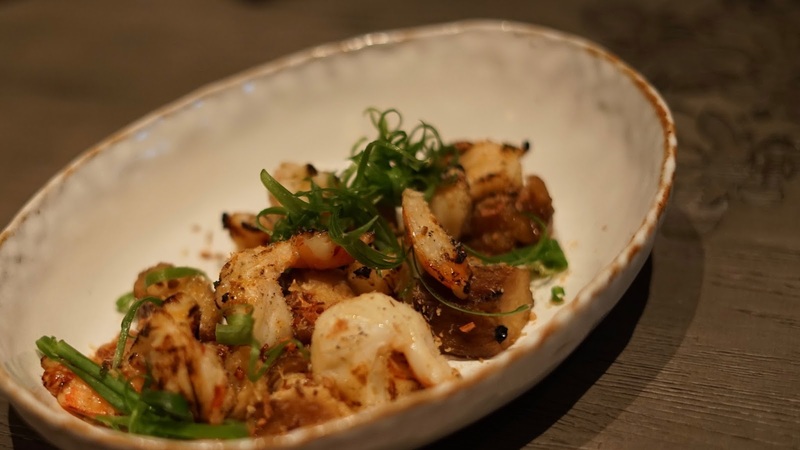 I’ve found that ginger can be very hard on the throat and overpowering, especially with scallops, but the dish was well balanced, with on the barest of a hint of ginger. Even the grapefruit, which can be so strong in flavour, was an able supporter allowing the scallop to shine. 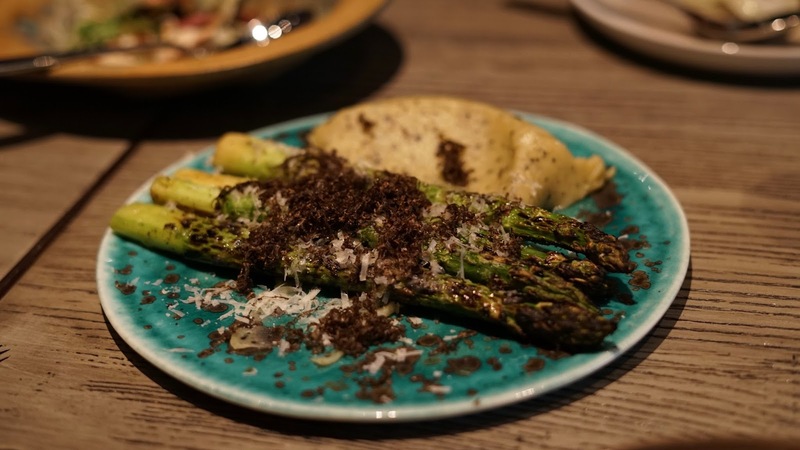 Moving onto some dishes from the grill, the agria potato puree with grilled asparagus and new season truffle got me pretty excited. I’m a huge fan of truffle and scallop together, and the truffled potato puree with piles of shaved truffle worked a treat with the slightly bitter sweet asparagus. It was a wonderful dish, but for me was crying out for some additional creaminess from a slow cooked egg. If that had been added, it would have been the perfect dish for me! 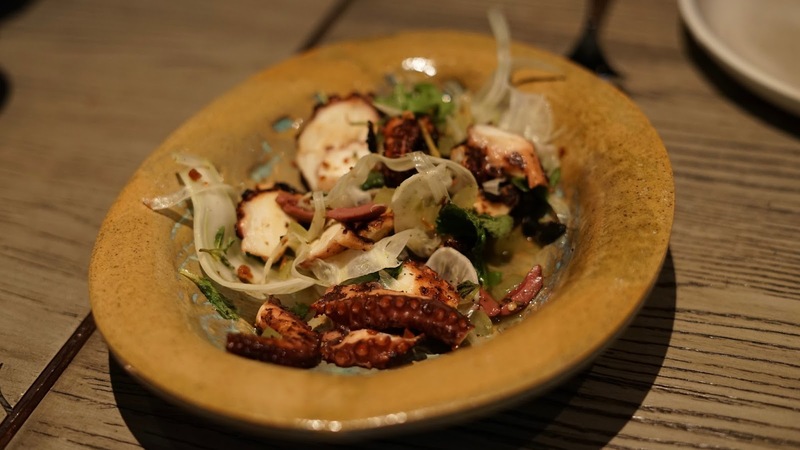 I love octopus and when it’s prepared well, is a true delight to eat. Rhoda’s version was slow cooked and accompanied by shaved fennel and preserved lemon. It excited me that I could clearly see the suckers on the tentacles, which is a little weird I know, but I love the feeling of those suction cups on my tongue when eating. The preserved lemon was a tad strong for the dish, becoming the prominent flavour, with the octopus becoming a little lost. John Dory is one of my favourite fish species, it’s a strong flavoured fish with firm flesh and generally works well with other strong flavours. 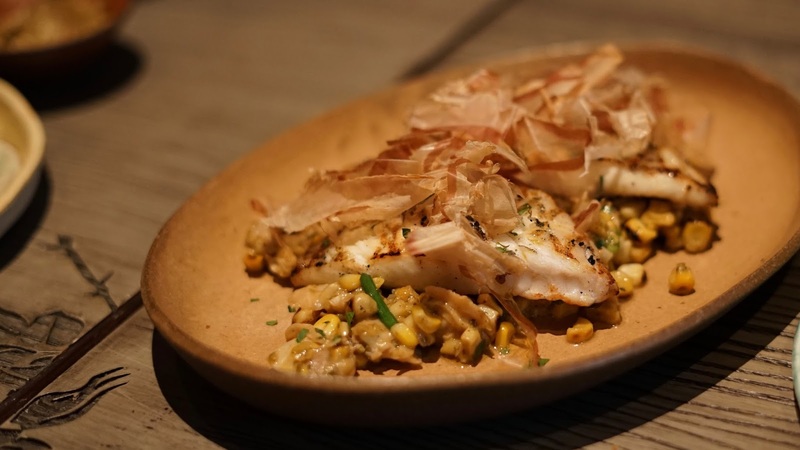 We were served pieces of Dory with grilled sweet corn, clams and katsuobushi (dried and fermented Tuna, a Japanese delicacy). 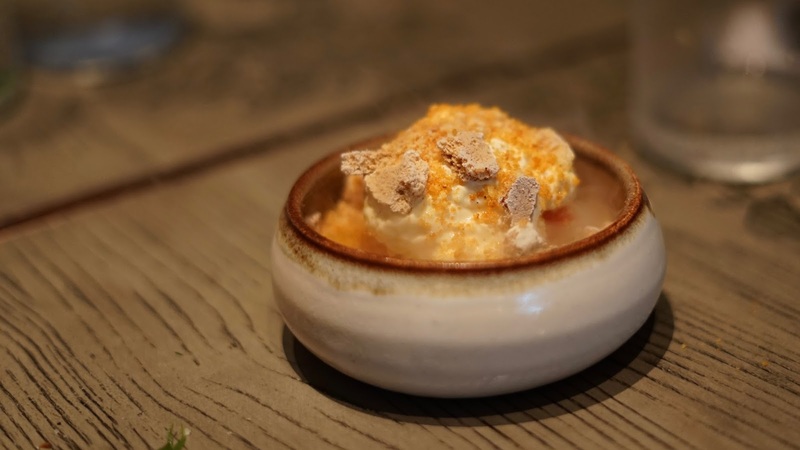 The dish was presented in a very rustic manner and really in line with the homely styling of the menu, which I quite liked. The Dory was cooked expertly and the dish was well balanced. I’d been watching the huge flames from the open grill dancing against a number of Brinks Farm organic, free range chickens for some time, and was so excited to taste the benefits of the cooking style. 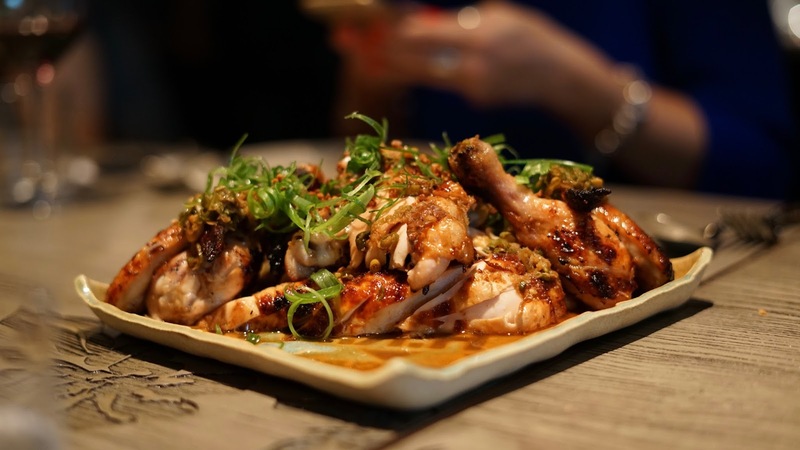 Sliced and diced, the chicken was presented in an interesting pile on an earthen plate and looked incredibly appetising. I went straight for the breast pieces, which had an intense charcoal flavour that was simply delicious. The flesh was moist and succulent and clearly benefited from being cooked over an open flame. I could totally understand why the dish was one of the signature plates, it was incredible. 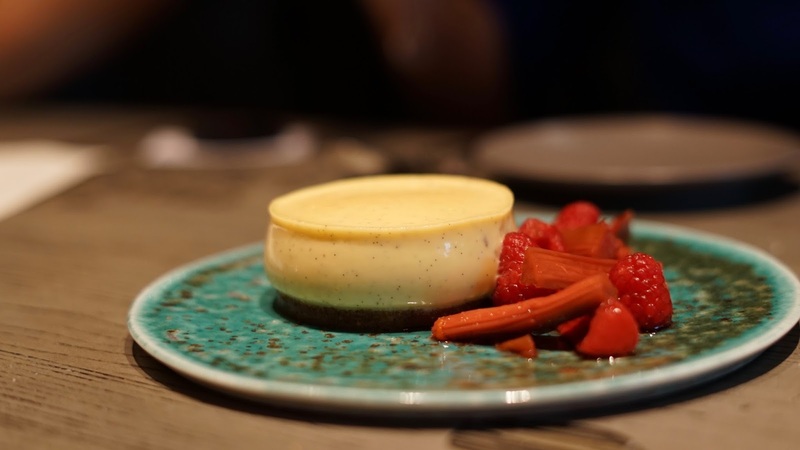 We’d been treated to some intensely flavoured food that completely subscribed to Nate’s nose to tail comfort food styling and it was time to jump in to some dessert. Starting off with the vanilla cheesecake with rhubarb and raspberry, the intensely sweet cheesecake was well balanced against the slight tartness of the rhubarb and raspberry. Simply presented, the cheesecake looked like a borderless creme brûlée. I particularly loved the bright colours of the raspberry and rhubarb against the aqua plate it was presented on. It was hard to pick a favourite dessert though, with both of the next desserts really ticking all of my usual sweet boxes. 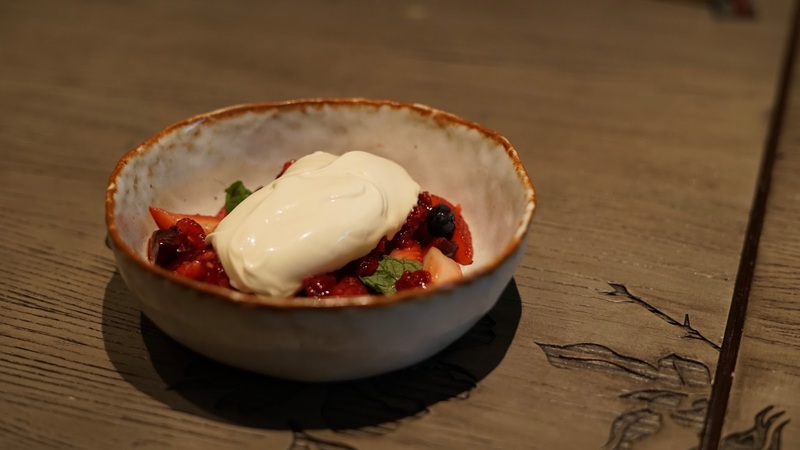 It was a tough choice, but if I only had to pick one, I’d choose the summer berries with cherry granita and lemon creme fraiche over the remaining desserts. Sure, there were some interesting flavours its the ginger biscuit trifle and the honeycomb and vanilla ice cream, but it was the freshness from the berries that really excited me on a hot summers evening. Throughout the evening we were able to watch Chef Nate controlling the kitchen and ensuring that everything was running smoothly. 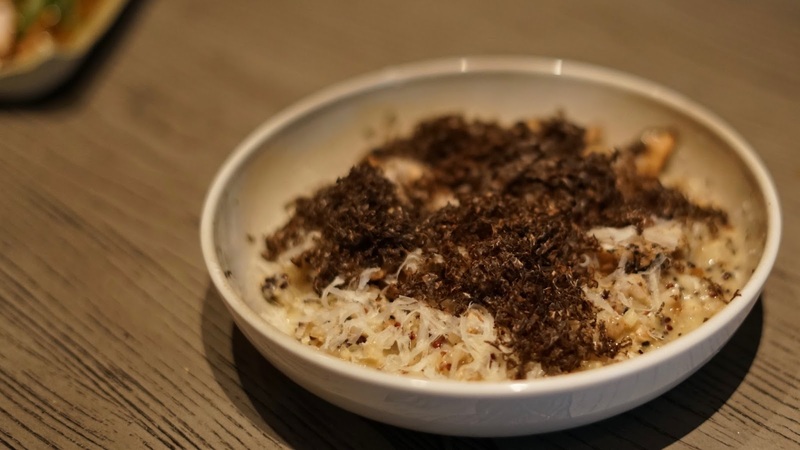 Recently opened, Rhoda didn’t have a massive and long soft opening like many restaurants do nowadays, the team just backed themselves to get it right from the start. I have to say that their confidence has paid off. 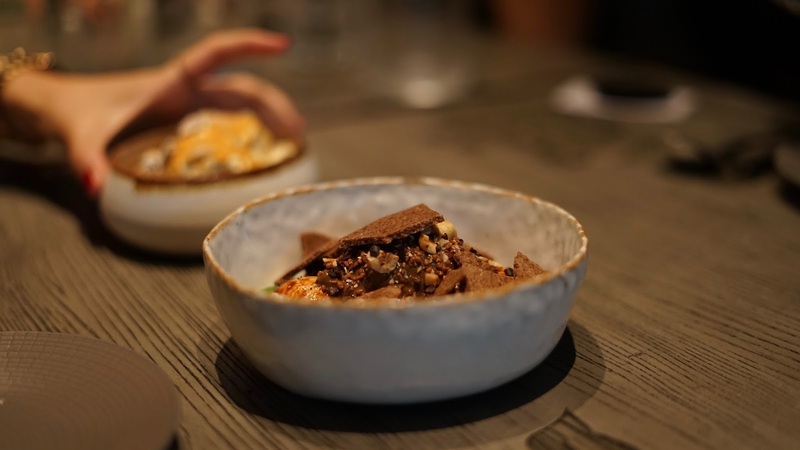 It’s not surprising though, Chef Nate has teamed up with the JIA group for the venture, a group that looks after some of my favourite restaurants in Hong Kong, including Aberdeen Street Social (the restaurant featured in my episode of Hungry Foodies – see episode here). The design of the restaurant, a great chef with a nose to tail philosophy and the team behind Rhoda mean that it’s bound to be a success. 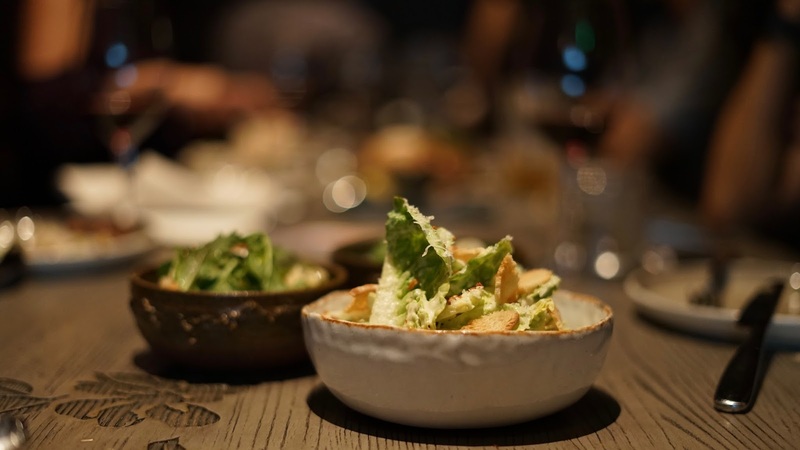 It’s also a place that I think I’ll be spending a lot of time at, with a cool vibe and great music playing throughout the meal, it’s definitely my kind of joint.